This year Wizard World New Orleans was back and bigger than ever! After having two shows in 2012 and none in 2013, Feb. 7-9 brought a bevy of local, national, and international talent to New Orleans for a few days to gather for fans, press, and more. The show expanded a lot this year, annexing another part of the convention hall, and selling, according to multiple people that I talked to, somewhere around 40,000 tickets. This is likely thanks, at least a bit, to former Doctor Who actor Matt Smith and various actors from the Walking Dead television show. On the more comic related side of things, there were hundreds of creators in attendance. Everyone from legends like Mike Mignola and Chris Claremont to indies like Fabian Rangel, Jr. or Inverse Press had tables and were selling comics to anyone interested. I had ordered a couple of sketches (which I’ll get to later), but was really looking forward to walking around and finding new comics to read and maybe buying something from a vendor or two. Upon making the 90 minute trip to New Orleans from my house and getting my wristband on Friday night, I quickly ventured into the convention hall, which was much busier than I remembered it being on the Friday night of the last con in 2012. My first stop was at Fabian Rangel, Jr.’s table, since we’re Twitter buddies and he was a familiar face. I chatted for a minute and picked up the last copy of his comic Los Muertos and his 215 Ink one-shot Engines of Doom, since I already owned all of his Doc Unknown work. After chatting some more with Fabian, I headed over to the table of Robert Wilson IV, the artist of Knuckleheads from Monkeybrain. 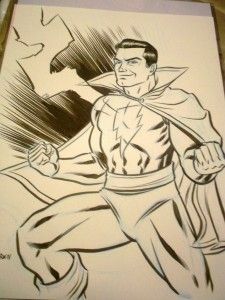 I’d pre-ordered a Captain Marvel/Shazam sketch from Robert, and, man, did it impress. I also got a copy of Like A Virus from Robert, which is definitely worth a read when it becomes available to a wider audience. 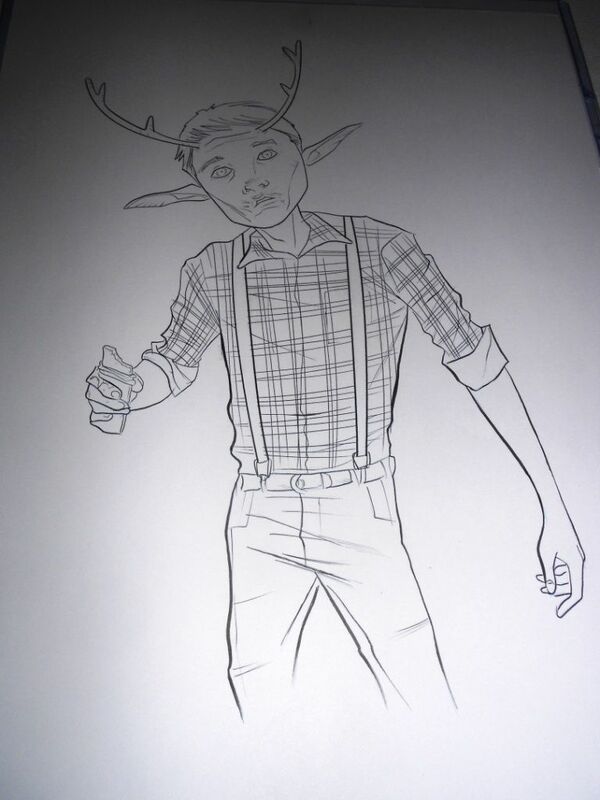 Right down the aisle from Robert was Joe Eisma, artist extraordinaire of Image’s Morning Glories, who I’d pre-ordered a sketch from also, this time of Gus from Jeff Lemire’s Sweet Tooth. Again, the sketch turned out fantastic, giving Gus a cleaner look than I think he’s ever had. After that was all taken care of, the rest of the night was spent walking around, scouting out everything to get prepared for Saturday. Saturday was the longest day of the con, and my last, going from 10 am to 7 pm, but there was plenty to do. Matt Smith had a gigantic line the entire day, but there was still plenty to be seen elsewhere. I spent part of the day looking, unsuccessfully, for a Pop! vinyl figure of Captain Marvel, but did manage to at least find a cool Captain Marvel shirt. A stop by the table of the always cool Rob Guillory, artist of Chew, was absolutely necessary and I picked up his variant to issue 6 of the TMNT ongoing and a print of the fan-favorite Poyo. Stopping by the table of a very tired looking Eric Powell got me a Goon trade and koozie. Plenty more time was spent at the tables of Inverse Press, Josh Dykstra and Kate Carleton, and more. 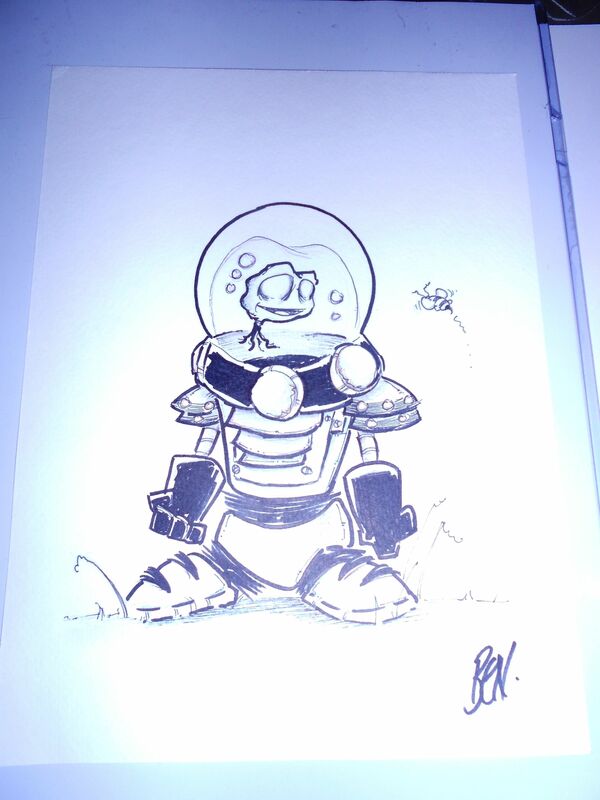 The con ended with a last minute sketch from Ben Bender, a great artist who I met last year at the show, of his own character Mert. There was definitely inventive cosplay this year. There were the usual Superman, Batman, Bane, Finn, Jake, and Wonder Woman cosplayers, but there were also some who went the extra mile. Like, the one girl who was Liz Sherman from B.P.R.D., complete with fake, glowing flames. Though, my favorite definitely had to be the guy I dubbed Giant Hipster Cyclops, dressed in the Cyclops outfit from the 90s animated show and possessing a glorious beard. 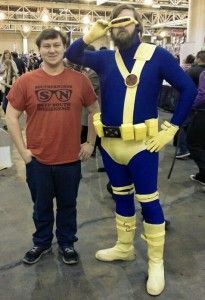 I was able to get a picture with him, and, for reference, I stand about 6 feet tall and weight somewhere around 250 lbs. He looks a little bigger. One interesting thing that I noticed while walking around was the number of artist who were selling prints of licensed characters, but not any books or drawings of their own creations. While I’m sure the prints sell a bit better, it’s always more fun to me to see new and interesting comics than another drawing of Batman. The one real sour note of the con was when I bought a comic for $5 after being sold on the story by the creators, only to read it and it only be 8 pages long, none of which really featured that story the creators had sold me so well on. 8 pages. 8. For $5. But, if $5 is the most of my worries, then I’m doing alright. 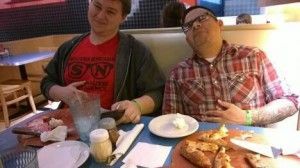 Saturday night ended on a good note, with a trip to Reginelli’s, a great New Orleans pizza chain, with Fabian and my buddy Charles. Everyone ate an entire pizza. We all left just a little fatter. All in all, Wizard World New Orleans was a blast. It’s growing quickly and is attracting a great group of creator, both big and small. Even in just two days, Friday and Saturday, I was able to see a lot of great creators and check out some great comics. Plus, there are very few cons in this part of the South, so it’s nice to not only see a show down here, but a pretty successful and well-done one. Awesome commentary, Leo! My family and I went to Wizard World Nashville last year, and got to meet, who I think is one of the coolest dudes out there, Jason David Frank (the Green Ranger)! We had so much fun, going from creator to creator, some really cool, and some more snobbish than I thought they would be. We’re going back this year too, and hopefully we’ll have just as much of a blast as we did last year!